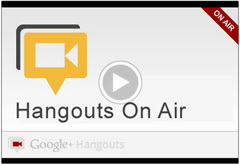 Google announced they are letting anyone with a Google+ account now use Google Hangouts On Air. The On Air version lets you broadcast your Google+ Hangout to everyone on YouTube and on Google+. It also means you can automatically archive the Google+ Hangout on your YouTube channel. I want to give this a try in the SEO space - so maybe I'll try this for some of our weekly SEO videos or maybe I'll try something new. The only issue is my ghost Google+ account and figuring out where Google will post this on YouTube?